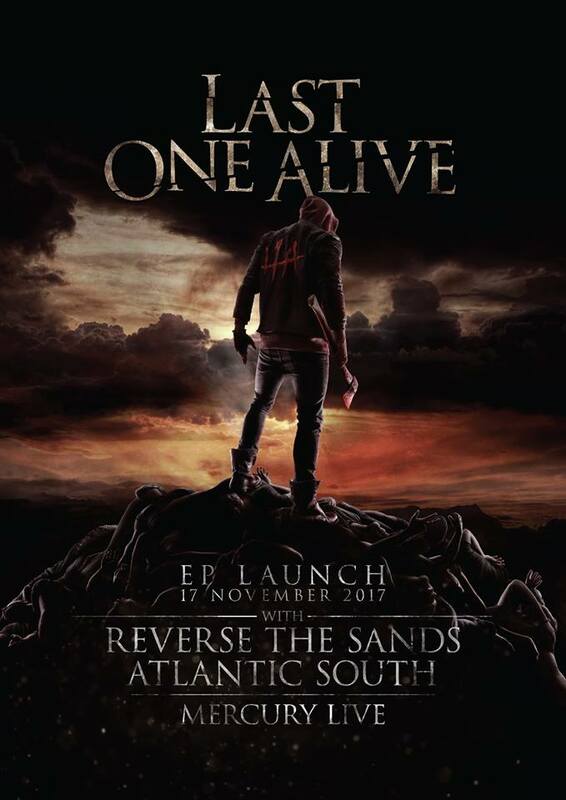 Last One Alive are relatively new to the Cape Town and South African music scene, however this project has been over 2 years in the making, and comprises of a super group of local musicians with a wealth of experience to their name. Even though they are relatively new, they have already won a SAMMA (South African Metal Music Award) for their music video for their single ‘Kiss the Ground‘. Originally the brainchild of the guitarist and producer of the project: Bobby Addison (Previously ‘ill system’ & ‘Death of an icon’) and Darran Smith (ex ‘Funeral for a Friend’), Last One Alive are at the core a metal band, but take many influences from rock and even pop, with classic song writing strung throughout. When Bob left the UK, and with Darran’s permission, he sought out musicians in South Africa to complete this project, and bring it to fruition. The other members in the band are made up of: Ric Shields – Guitar (Also the bassist for ‘Atlantic South’), Dane Canterbury – Drums (Also the drummer for Megalodon), Joel Dickson – Vocals (Also the vocalist for Animus Fall) and Miggs Auer – Bass (Also the bassist for 7th Son, Goodnight Wembley and VOL). As you can see, these are some of the best musicians in South Africa at the moment, and Last One Alive is the Super Group we have all been waiting for. Now, to get to the important part of this review, the music itself. I was fortunate enough to be selected to get an exclusive digital press preview of the EP, and I couldn’t be happier. The EP opens with goosebump-inducing: ‘Runaway‘, this track sets the tone for the upcoming sonic onslaught. It fades in with an EQ sweep of a riff that could literally destroy worlds, and when the song kicks in, the hair on my neck immediately stood to attention. It is a fantastic track and showcases where this band is going with the rest of the EP. I also love the sing-along chorus, which will be stuck in my head for a while. Second up is the bands first single, and SAMMA music video award winning ‘Kiss the Ground‘. This track is also a showcase of Bob ‘The Riffmaster’ Addison’s songwriting and guitar riff skills. It opens with an epic drum fill (Originally recorded by Art Pereira , who was the original drummer), and smacks you right in the face, I literally felt I was going to kiss the ground at that point. Joel’s vocals on this track are particularly polished, and showcase his range and depth as a vocalist. I especially love the line: ‘You fought for nothing, and now you bleed for it’. The third track is ‘Blood and Salt‘, which is the band’s 3rd single from the EP. This is personally my favourite track, and it definitely has the most long-standing appeal. It has elements of Soundgarden, Tool, Muse and While She Sleeps. It is the ultimate showcase of how damn talented these boys are. I have listened more than the other tracks, and I can’t help banging my head every time I hear it. Absolutely a kicker! Coming in fourth, is the band’s 2nd single ‘Revolve‘, which is a politically charged track, reminiscent of Body Count’s latest album. The weird thing is that it has the most poppy chorus on the EP, with a hard metal backing. Whilst I do enjoy it, I found it a bit jarring, and I personally feel it could have been a bit more impactful if this element was removed or altered. The song still kicks hard, and will still be enjoyed when you look at it in the context of the EP. Fifth track is ‘Coming Apart Again‘, it feels like a sequel to ‘Kiss the Ground‘, but with more pop influences. Definitely the sing along track, with some strong vocal lines from Joel again. The break in this song, leading into the end, is very much in your face and hits you right in the chest. I also felt it showcased the play between Ric and Miggs tight playing here, as Bob’s guitar took a back seat. The final and sixth track is ‘Dead in the Water‘, and it’s the heaviest track on the EP. Reminds me of a mixture between Rammstein and The Haunted, except the chorus which has a very Bullet for my Valentine or Trivium feel. Some excellent guitar work again, and Riffmaster Bob is at it again, with the peaking riff of the song shredding apart reality itself. Overall I would give the EP 8.5/10, with my only gripes being the short length (I need a full album dammit! ), and one or two jarring moments where I felt tracks were written as singles versus being written with a whole EP or album in mind. Other than that, the production is of international standard, and definitely one of the best productions to come out of South Africa recently. Last One Alive can be proud of what they have achieved here, and I am looking forward to seeing what they have in store for us in the future.